Yes, I know I’ve been away for a long time and am way behind on my movie reviews. I’ll start by catching up with this weekend’s new movies, and then I’ll try to post some of my other reviews of recent past movies, as well as my “Best of 2017” (and my “Best of 2016”) lists, soon. They aren’t the same as the conventional (a/k/a liberal) movie critics. I have some stuff on my lists you probably didn’t know about and can now Netflix (or Amazon, etc.). And now, to this past weekend’s new movies, there was only one I liked, but I liked it a lot relative to the other poor choices recently. * I, Tonya – Rated R: I like this movie a lot, mostly because, as I’ve written on this site before, I rooted for Tonya Harding. I was away at grad school at the time, and I remember my parents calling me when the knee-whack heard around the world happened in our native Detroit. I remember my Dad and Mom telling me how they were rooting for Harding at the nationals and in her bid to get to the Olympics because they felt she was unfairly maligned. Unfairly maligned for being working class and not beautiful, because she had cheap costumes (that she and her mother sewed themselves), and because the mainstream media picked favorites, and they chose to anoint the more conventionally beautiful Nancy Kerrigan (who had the personality of dry beige paint). Read my column on the 20th anniversary of the Soap Opera of Tonya & Nancy. Harding was the better skater–the best in the world at that time and only the second woman to land the triple axel. But she never got credit for it. Instead, she was seen as a nasty lowlife criminal and hillbilly (if one can call people from Portland, Oregon, “hillbillies”). Like my parents did then, I like to root for the underdog, and Harding has been that all of her life. When the whole world wants to beat up on someone, I prefer to look deeper rather than joining the piling on. My parents taught me that with Harding and many other examples. Plus Tonya had something Nancy didn’t. She had guts. She had grit. She had chutzpah. As I’ve always said, the knee-whacking was the best thing that ever happened to Kerrigan. It got her decades-long fame and made her multi millions. Without it, she’d be just another has-been figure skater long forgotten a la Debi Thomas (remember her?–she’s now broke and living in a trailer) and others whose names we’ve forgotten or never even knew in the first place. And, as I’ve also noted–while I don’t approve of assault–I’ve never seen any evidence that Tonya Harding knew of the plans of her crazy then-husband and his fellow clown friends to kneecap Kerrigan. This movie, told mostly from Harding’s point of view (a view we never saw in the 24 years since the knee event, until now), has that same perspective. Although Margot Robbie looks nothing like Tonya Harding, she pulls off the role (and she had the entrepreneurial spirit to produce this movie and seek out Harding to tell her story when no one else was interested anymore). The movie is funny, entertaining, and told me things I never knew. I generally don’t like movies based on real-life stories because they usually take too many liberties with what actually happened in reality. But this is one of those that gets it mostly right. Did you know that Tonya Harding’s mother, LaVona (Allison Janney, who is terrific and nails it), wore a wire for a tabloid TV show and tried to secretly record her daughter for money? There are also accusations in the movie that Harding’s then-hubby Jeff Gillooly beat her. I don’t know if that depiction is accurate. Whether or not it is, the story told here makes for a more sympathetic Harding than the world was instructed to see by the mainstream media. As the movie shows, Gillooly, Shane Stant, and Shawn Eckhardt (Harding’s self-appointed bodyguard) were constantly talking about plots on people that they weren’t serious about and Harding was mostly oblivious to what they were saying. What she did hear–she never thought they’d actually do, other than maybe making some phone threats to an ice arena where Kerrigan skated in suburban Boston. Yes, there’s something wrong–not to mention, illegal–with making threats–but, again, there’s no evidence Harding knew what they were going to do or thought they’d ever actually do anything. In an interview set to air Thursday on ABC, Harding does say she thought something was up, but not that she knew what was up. The movie shows Tonya’s life growing up and how her mother went through multiple husbands. It shows her single mother forever smoking and working several waitressing jobs to pay for Harding’s skating lessons and ice time. And then it shows what happened in Detroit at the national ice skating competition, as well as the Olympics, and the aftermath. * Hostiles– Rated R: I’m normally a big fan of Christian Bale. He’s a great actor and generally picks his films wisely. But not this time. This was screened for me and another Detroit-area movie critic just before Thanksgiving. And the message was clear: “Happy Thanksgiving, evil White man who raped this land and murdered its native population.” The movie is supposed to be a Western told from the point of view of American Indians. We are the bad guys, they are the aggrieved, oppressed, persecuted, and annihilated. And, again, we are the evil ones. It’s an anti-American, social justice warrior movie, plain and simple. I don’t like being lectured at the movies. This was a two-hour-and-thirteen-minute-long lecture. And it was long, slow, and boring. It was repetitive and seemed like a four-hour movie. Although there is a scene of Indians scalping a White man and killing his wife’s children, make no mistake about what this is. The rest of the movie is evil White men slowly murdering the innocent Indians. The story: Bale is a U.S. Army captain and battle-worn hero. He’s fought off Indians and hates them. Now, in the early 1890s, he’s ordered to do something he strongly opposes: take the Cheyenne Indian Chief and his family back home to Montana (no, not Wyoming), so the Chief can go there to die. The Chief is a prisoner and has been for several years, but now he is dying of an illness (apparently cancer). Bale is opposed to this because many American soldiers have died at the direction of the Cheyenne chief to his men. But Bale has no choice. He’s been ordered by his commanding officer to do so, in part because of his legendary fighting ability and in part because Bale speaks the Cheyenne Indian dialect. Across the American landscape on the way to Cheyenne, Bale and the Chief and his family encounter many Indian-haters seeking to kill them. The movie is very bloody and violent and filled with death and destruction. Bale and the Indian Chief and family are accompanied for most of the way by the aforementioned widow and bereaved mother whose husband and kids were murdered by Indians. **** SPOILER ALERT ****: At the end of the movie, the only ones left are Bale, the woman, and a little Cheyenne boy. They take a train to Chicago, and then that’s it. I was disappointed, as the social justice warrior motif wasn’t fulfilled. We needed them to move to Montana to get Cheyenne tribal awareness and sensitivity training. And then we needed them to be sued by someone who is 1/64th Cheyenne because the evil White man has no business adopting and raising someone of the Native American race. But alas, the credits ran instead. And, frankly, those were far more welcome. Because it meant that this annoying social justice lecture was finally over. * Insidious: The Last Key – Rated PG-13: This is the fourth of the Insidious movies. When there is a series of movies, I usually try to see all of the preceding movies, before I review a sequel. But I think I’ve only seen Insidious: Chapter 3 (read my review). All four movies apparently feature the same female heroine – a medium named Elise Rainier, played by Jewish Detroiter Lin Shaye. As I said in my review of Chapter 3, it’s unusual for Hollywood to feature a senior citizen or older lead character. This movie does, which I liked. Shaye is age 74 at this point. As I noted in my review of Chapter 3, I see a lot of scary movies, so I’m jaded. What used to make me jump out of my seat, doesn’t anymore. It’s a lot harder to scare me, these days. Chapter 3 scared me a lot. This movie, not so much. Although there were a few scares, it was so stuffed with things, that it wasn’t scary so much as deliberately disturbing. And not in a good way. I don’t need to see briefcases full of dead women’s skulls. Yuck. There was a lot of ick factor here. But not a lot of psychological scare (that’s what the good scary movies do, instead of resorting to gore). 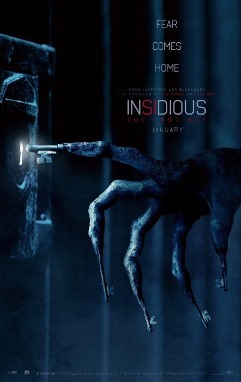 This is supposed to be the last Insidious movie, but knowing Hollywood and its addiction to easy sequel cash, I’ll bet it isn’t really the final one in the series. This is an “origins” movie, in which we learn about the early, troubled life of Rainier and how and why she became a medium. It flashes backward and forward to present day, which is kind of confusing. Both the present and the past take place at the same creepy house. Rainier’s father is a prison guard (or warden–the movie isn’t clear which), and her house is haunted with spirits. Years later, she is called back to the same house to examine and eliminate evil spirits still infesting the place. And through the process, she comes to some scary revelations and discoveries. Along with her, she brings her usual gang of two “ghostbuster” types filming and taping the whole thing and helping her to face what is going on and fight it. Not the greatest horror or scary film. Not even close. Relies too much on the grotesque and macabre for my taste, without the substantive story to back it up. But it’s mildly–very mildly–entertaining as a scary movie, if that’s what you’re into. Look at Tonya Harding’s 1991 US Figure Skating Championship Free Skate which includes a triple axel. It was a brilliant and exciting program. At the time she was my favorite woman figure skater. Debbie, welcome back. Missed you, and my account too was suspended in Twitter, and I’m not giving them my phone# to get it back, so my Twitter activities are over. A merry Hanukkah to you. I too like Tonya Harding, really beautiful to me over that bland Kerrigan or the others like Oksana Baiul or Kristi Yamaguchi(token Asian skater for the pc era).She was different, not all grinning like an idiot like they did using looks to get by more than talent. Oh and did you hear of the wearing of black yesterday for a showing of solidarity?. So funny in that they may have offered themselves to get certain parts over the years or may have been into younger men, younger than 18, like Cher. Now suddenly they’re all victims, what baloney. This whole thing is just punishment for Harvey Weinstein failing to get Hillary into the White House, if he’d succeeded what are the odds most of them would’ve remained silent?. Neither Harding nor Kerrigan were as good as Oksana. It was always a battle for Silver. I second Infidel in welcoming you back, Debbie. You were missed. Per Debbie’s reviews, I plan on seeing the first movie and skipping the other two. I don’t think Hollywood makes westerns about quaint things like the plight of American Indians any more. Hostiles is about terrorists and American servicemen. That’s what the moviegoer is probably meant to take away from that metaphor I believe. And it’s targeted directly at the audience that would be susceptible to a western. I used to pay attention to skating, but in the end it’s a judged activity and you’re only as good as the judges. Who’s to say who is REALLY the best. I don’t follow the Olympics AT ALL for ages now. Too commercial, too corrupt. Who cares. The Olympics have been utterly corrupt for decades. Most particularly in the ” judging ” events. The boxing in Munich 1968 where the German fans openly insulted and shamed the judges. The basketball tournament in 1972, which was so FIXED that an ad infinitum boycott would have been justified. The openly corrupt French figure skating judge. I can’t remember them all, offhand. And I’m not even mentioning when the Western countries could only enter bona fide amateur athletes while the ” Eastern block ” Communist countries openly entered professionals. Nice outline of the corrupt Olympics. I thought the boxing scandals occurred in the 1972 Munich Olympics (where the Soviet block boxers were awarded wins where they obviously hadn’t won against American boxers). That Olympics also had the slaughter of the Israeli Olympics. And let’s see if the North Korea athletes who are apparently going to participate next month in the Winter Olympics are there to compete or are there to disrupt the Olympics. Welcome back Debbie. Thank you for your movie reviews. I had heard that “I, Tonya” was a good movie but I don’t trust anyone out there except you. 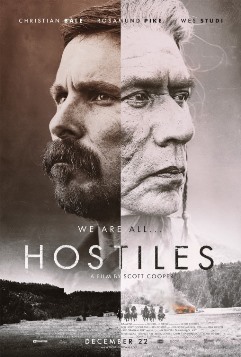 As for “Hostiles,” I suspected it was an anti-American, anti-white male and anti-military movie. I find it fitting that Little Dicky “Turban” Durbin has been in the spotlight for his “heroic” exposure of Trump’s alleged “sh*thole” comments (which by the way I agree with, even if Trump didn’t say them). Dicky Durbin in 2005 maligned the US Marines at Guantanamo Bay by comparing them to Nazis, the Soviets, and Pol Pot. We all know to expect more of this. With regard to Tonya Harding, I believe her concentration and mindset were destroyed by the allegations made by the press and others. It is a shame. And thank you for the update on Debi Thomas. I didn’t know she was living in a sh*thole. It really is a shame. People like Debi Thomas and Tonya Harding are destroyed to some extent in their lives by life, but vile POS such as the Clintons, Comey and Lynch (and let’s not forget the Obama’s) reach Mt. Olympus to some extent. Life’s not fair – God will sort it out afterwards. P.S. I saw the recent Star Wars movie. I never have been a fan. I knew something bothered me about the movie. I went on line and found out why I was bothered. The only Star Wars movie that I really like is The Empire Strikes Back. Mean and nasty. Excellent analysis of the movies. I feel Schlussel’s reviews are even more valuable showing those forces shaping or attempting to shape the thought process and values of our nation, both when good and when bad. Besides saving us from bad movies, its the clear analysis that is of real value here. The excellent writing doesn’t hurt. Regarding “I, Tonya”, the movie was as described. I see Tonya was treated unfairly. She had the guts to overcome then as now, unlike those who manipulated her, treated her unfairly, or put her down. Hats off to Tonya Harding. A note on underdogs, I root for the underdog when they really are the underdogs as Schlussel points out was the case with Tonya Harding. I do not root for them when they are self-made underdogs to that purpose, that is to say, I do not automatically root for all underdogs. I like Schlussel’s model of figuring out who the underdogs really are. Nice Movie Hollywood is really good for animated movies. I like horror movies and I am waiting for more horror movies.